Local purchase: currently available locally in Big Sur at Big Sur Station. REI Marina does not stock them (I couldn't get a reason why). On-line ordering: Green Trails Maps store - $16 but they require a purchase of 3 maps, some choices being Monterey Peninsula, Santa Cruz, Big Basin, Henry Coe W. State Park, and places further north. . .
Local purchase: available at many local stores, such as REI Marina. Local purchase: available at many local stores, such REI Marina. Local purchase: available at USFS Monterey Ranger District Office (406 S. Mildred Ave, King City). Note: All of these printed maps are more accurate and complete than those in smartphone apps which use USGS or OpenStreetMap maps. Format-wise, different people have different preferences. 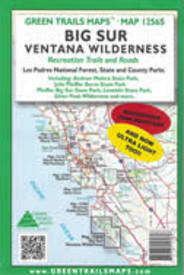 Personally I like the simpler Wilderness Press map format best, considering it the most readable when out on the trail. Next would be the Green Trails map, which provides additional information yet is still clean and readable. Then the USFS map which adds surface vegetation information, which may be useful but which also makes map reading more difficult. Last is the even more complex and less easily read National Geographic map. But to me the most important consideration is accuracy and completeness, not format. I want to be able to rely upon my map! So accuracy and completeness for hikers guides my choices below. Currently I consider the Wilderness Press map the least accurate and least detailed, so it would be my last choice. (Here I refer to the "2014" map, which eliminated many of the now infamous errors found on the "2005" map.) The USFS map is comparable in accuracy and completeness but adds vegetation cover information, so I consider it slightly preferable - but it is not widely available. The current National Geographic map is accurate for what it depicts, having been pored over by VWA locals for errors (after the original version was recalled due to egregious errors, which I pointed out to National Geographic, due to their having relied solely on USFS data). But it has two drawbacks. First, it's scale is relatively large compared to the other maps, so can be more difficult to read and use in the field if needing detailed information such as local topography. (Though some might view this as a "feature", since the map then covers a larger area and so includes trails in Pinnacles National Park and on the Monterey peninsula.) The other is exclusion of almost all use trails, even though some "use trails" are more utilized and in better condition than some "official" trails. So my first choice is the Green Trails map. It shows all significant local use trails and better detail than any other map. [Full disclosure: I was involved in the creation of the Green Trails map and am credited on that map - which is why it depicts so many locally-known use trails. But I did not get any remuneration for that, nor do I for maps they sell.] It's drawbacks? A personal quibble is its folded size, which is wider than the usual map and does not fit in the hand easily. Its biggest drawback is its limited availability and difficulty of obtaining one. For the average Big Sur hiker, the National Geographic map is "good enough" - its accuracy and completeness for official trails is good and it is widely available. If having more detailed topo information is important to you, then consider the higher-resolution Wilderness Press map, another widely available map. Hard-core Big Sur hikers, though, the ones who want to go everywhere in the Big Sur wilderness areas including places reached only by use trails, should get a Green Trails map - it's the most complete and accurate of any of these maps and is what I personally carry in my pack.